We are expecting a snow-nami, or snow-mageddan whichever you prefer. Either way, we are expecting a dump of snow later today with sleet and ice. I can handle the snow, its the sleet and ice that is treacherous. I know all you peeps that just survived the recent storm back east have little sympathy, but its sleet and ice people? The mess your car up, end in a ditch, fall on your a$$ kinda stuff! The grocery story was crazy with folks stocking up last night, and generally when this happens, everyone forgets how to defensively drive so they end up being the cause of most accidents. In case you didn't see on the news last night, there was a huge gas explosion here in KC on The Plaza. Yes, the same Plaza I am always talking about! My heart goes out to those effected by the blast and fire, and I am thankful we were home last night. It is scary to think I was just there Sunday afternoon! 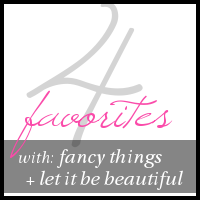 I hate to be a downer after such fun four favorites..... Don't forget I am linking up with the girls again this week so check out what are their favorites this week too! I love to find new treasures and places to shop! Leave me a comment sharing some of your favorite places to shop! I am a sucker for a boutique too! I love that crossbody bag! Such a pretty color! We got snow here yesterday :/ I'mm ready for winter to be over! I love that crossbody bag too, and the blue is so pretty. I am with you on winter needs to be over! Hope we don't get as much as they predict! I think all the K Slademade bags are gorgeous, I want one! I hope the snowstorm isn't too terrible. I am so glad we don't have any snow on the ground at the moment and I'm really hoping that was the last storm of the season. Your lucky all your snow is gone. Generally it lingers here for weeks before melting away. I am a big fan of K Slade and have one of her bags from last spring. This would be a perfect crossbody though to have! I finally just found some jeans at H&M. I've tried on some before and they were horrible. It took a while! I love that crossbody. Gorgeous!! Thats what I am afraid of, the fit being horrible. I know that bag is gorgeous right? I know, it's so sad about JJ's and the Plaza :( I love your picks--that coffee set is adorable and I think I need one of those organizer pouches. Stay safe and warm during the snowstorm Lisa!! I'm thinking about getting some boyfriend jeans, too! I've never had a pair, but their so popular right now that they've peaked my interest & I really want to know how they would look on me! That cross body bag is super cute as well! I am hoping I can find a great pair of boyfriend jeans without looking too sloppy. I love K Slademade bags, you should def check her out!